Go to original pattern for design DROPS Baby 29-12. 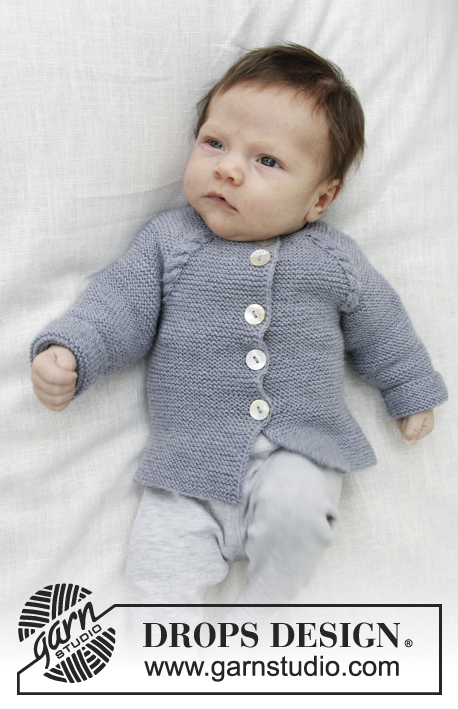 Knitted baby jacket with cables, garter stitch and raglan, worked top down. Sizes: premature – 4 years. The piece is worked in DROPS BabyMerino. 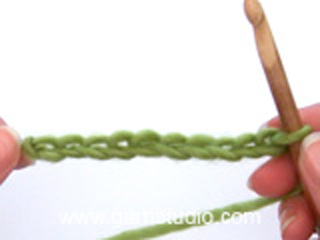 DROPS CIRCULAR NEEDLE (60 or 80 cm) SIZE 3 MM – or the size needed to get 24 stitches and 48 rows of garter stitch on 10 cm in width and 10 cm in height. CROCHET HOOK SIZE 3 MM – for the edge. DROPS CABLE NEEDLE – for the cables. DROPS MOTHER OF PEARL BUTTONS, Arched (white) NO 521: (4) 5-5-5-6 (6-6) items. Work to the first A.1, 1 yarn over, work A.1, 1 yarn over. Repeat by all A.1 and A.2 (= 2 stitches increased by each cable = 8 stitches in total on the row). 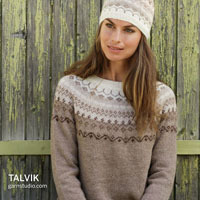 On the next row, the yarn overs are knitted twisted to prevent holes. Decrease 1 stitch in each side of the piece as follows: Work 1 stitch in garter stitch, slip 1 stitch as if to knit, knit 1, pass the slipped stitch over (= 1 stitch decreased), work in garter stitch until there are 3 stitches left, knit 2 together (= 1 stitch decreased) and finish with 1 stitch in garter stitch (= a total of 2 stitches decreased). The first buttonhole is made when the piece measures approx. 1 cm, then make the next (3) 4-4-4-5 (5-5) with approx. 4 cm between them. Decrease from the right side for the buttonholes on the right band (when the garment is worn) as follows: Work until there are 4 stitches left on the needle, make 1 yarn over, knit 2 together and knit 2. On the next row, knit the yarn overs. There will be holes. 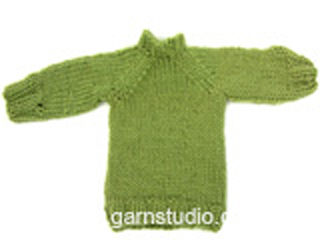 The jacket is worked top down, back and forth on circular needle from mid front. The sleeves are worked back and forth on circular needle and are sewn together at the end. Cast on (72) 72-80-80-80 (80-84) stitches (including 4 band stitches in each side towards mid front) with circular needle size 3 mm and Baby Merino. Work 2 RIDGES – see description above and increase 8 stitches on the last row = (80) 80-88-88-88 (88-92) stitches. The next row is worked as follows from the right side – remember BUTTONHOLES on the band – see description above: Work (11) 11-13-13-13 (13-14) stitches in garter stitch (= left front piece), A.1 (= 6 stitches), work 10 stitches garter stitch (= left sleeve), A.2 (= 6 stitches), work (14) 14-18-18-18 (18-20) stitches in garter stitch (= back piece), A.1 over the next 6 stitches, work 10 stitches in garter stitch (= right sleeve), A.2 over the next 6 stitches, work (11) 11-13-13-13 (13-14) stitches in garter stitch (= right front piece). Work 1 row from the wrong side. 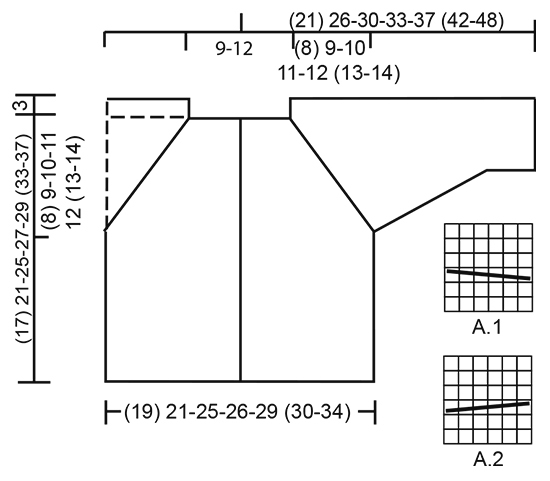 Increase to RAGLAN – see description above – on each side of every A.1 and A.2 as follows: Increase 1 stitch on every 2nd row (0) 4-5-7-11 (12-16) times, then 1 stitch every 4th row (9) 8-9-9-8 (9-8) times = (152) 176-200-216-240 (256-284) stitches. REMEMBER THE KNITTING TENSION! The piece measures approx. (8) 9-10-11-12 (13-14) cm from the cast-on edge. The next row from the right side is worked as follows: (23) 26-30-32-35 (37-41) stitches in garter stitch, place the next (34) 40-44-48-54 (58-64) stitches on a thread for the sleeve, cast on 7 stitches under the sleeve, work (38) 44-52-56-62 (66-74) stitches in garter stitch, place the next (34) 40-44-48-54 (58-64) stitches on a thread for the sleeve, cast on 7 stitches under the sleeve, work (23) 26-30-32-35 (37-41) stitches in garter stitch = (98) 110-126-134-146 (154-170) stitches. Insert 1 marker in the piece, THE PIECE IS NOW MEASURED FROM HERE! Work garter stitch until the piece measures (9) 12-15-16-17 (20-23) cm from the marker. Cast off. Place the (34) 40-44-48-54 (58-64) stitches from the thread back on circular needle size 3 mm. Insert 1 marker in the piece, THE PIECE IS NOW MEASURED FROM HERE! Cast on 4 stitches at the end of the next 2 rows (= 4 new stitches in each side of the piece) = (42) 48-52-56-62 (66-72) stitches. Work garter stitch back and forth. 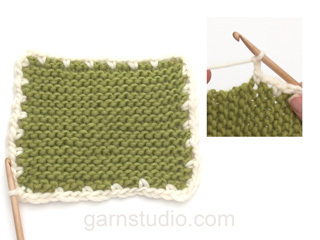 When the piece measures 2 cm from the separation, decrease 1 stitch in each side of the piece – READ DECREASE TIP. Decrease in this way every (10th) 8th-8th-6th-6th (8th-8th) row a total of (3) 5-7-9-11 (12-14) times = (36) 38-38-38-40 (42-44) stitches. 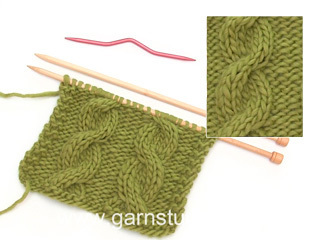 Continue with garter stitch until the sleeve measures (10) 14-17-18-21 (24-29) cm. Cast off. Work the other sleeve in the same way. Sew together the sleeve seams inside the 1 edge stitch. Sew together the opening under the sleeves. Sew the buttons on to the left front piece. Crochet an edge along the entire opening of the jacket with hook size 3 mm as follows, begin mid back on neck: * 1 double crochet, 1 chain stitch, skip forward approx.0.5 cm *, repeat from *-* and finish with 1 slip stitch in the first double crochet. Bonjour, je ne comprends pas bien : \r\n1. Les diagrammes : s\'ils représentent seulement l’endroit, ça signifie que les rangs sur l’envers sont tricotés à l’endroit (point mousse) sauf A1 et A2 tricotés à l’envers ?\r\n2. A quoi correspondent A1 et A2 une fois débutées les augmentations, svp ? (A1 et A2 = 8 mailles, puis 10mailles, etc. ? Où caler les augmentations ? )\r\nMerci de vos conseils ! Bonjour Manoa, les diagrammes représentent tous les rangs des diagrammes vus sur l'endroit, A.1 et A.2 vont donc se tricoter en jersey endroit (= une case blanche = 1 m end sur l'endroit, env sur l'envers), et les torsades se feront au 3ème rang de A.1 /A.2. Les diagrammes se tricotent sur 6 mailles tous les 2. Vous augmentez avant et après ces diagrammes et tricotez les nouvelles mailles au point mousse - cf RAGLAN. Bon tricot!